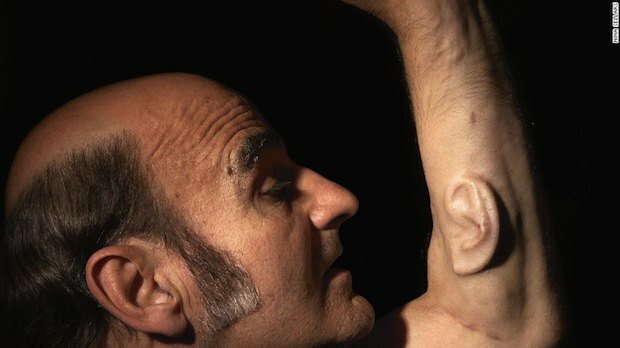 An Australian performance artist named Sterlac has grown a third ear on his arm. The ear was constructed using a frame made out of biocompatible material that's often used in plastic surgery. Once the sculpted ear was transplanted into his arm, Sterlac's own tissue and blood vessels began to fuse with the material. Now the ear is a living, feeling part of his body. Sterlac hopes to eventually implant a wifi-enabled microphone into the ear, allowing his audience to listen in to Sterlac's life 24/7. "This ear is not for me, I've got two good ears to hear with. So wherever you are and where I am in the world you'll be able to listen in to what my ear is hearing," Sterlac told CNN.